Rotherham development company, St Paul's Developments, has sold the last remaining unit at Brookfields Park to the British Red Cross, signalling the completion of the important Manvers regeneration scheme. St Paul's and funding partner Tritax Assets Ltd purchased the 85 acre former colliery and coking plant site from Rotherham Council in 2005 and since then, brownfield regeneration specialist St Paul's Developments has completed around 1.7 m sq ft of industrial and warehouse space, bringing over 1,800 jobs to Rotherham. Nearby Cortonwood colliery is where the 1984 miners strike began and was also the first colliery to be closed after the miners strike ended. In the Dearne Valley, historic job losses in the coal industry added to substantial pre-existing unemployment problems. It is estimated that 10,000 jobs were lost in the area alone. With regeneration schemes such as land reclamation and the Enterprise Zone, private sector job growth to 2008 offset the job losses and helped the Rotherham economy become more resilient. The old Wath ward alone experienced an increase of 10,000 jobs since 1998. As part of the regeneration, a retail park was developed with over 500,000 sq ft of retail space including occupiers like Morrisons Supermarket, Asda Living, Next, B&Q and Boots. A residential quarter was also created with around 600 houses built around a landscaped lakeside setting. Work is due to start in 2015 to create fully serviced platforms for a final phase of 153 houses, and 80 apartments. 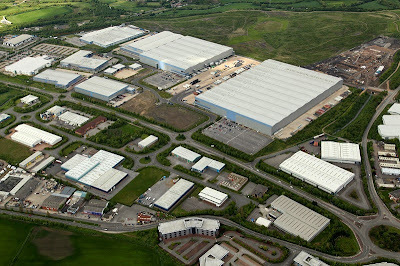 Brookfields Park has been responsible for attracting major inward investment through some of the region's largest industrial lettings and is home to Next Group plc's two warehouse units which total 1.1m sq ft, Maplin's 196,000 sq ft HQ and warehouse, Garnett Dickinson's 125,000 sq ft printing facility, a 105,000 sq ft state of the art warehouse pre-let to Pegler Yorkshire Group and Thetford's 83,000 sq ft manufacturing facility. Other occupiers nearby include Capita, Glassolutions and the S2S Group. In 2013, Next also purchased the final five acre plot for future expansion. Properties on Brookfield's Park have also been considered good investments with recent deals including a new UK commercial property joint venture formed by Oxenwood Real Estate and Catalina Holdings purchasing Maplin's HQ for £15m, Aviva acquiring one Capita call centre for £30.5m and Tritax sealing a deal worth £87m with Legal & General Property for the two Next units. The British Red Cross has taken a 5,000 sq ft unit in the Brookfield's Light development with Commercial Property Partners, Knight Frank and Chris Rowlands and Co acting for St Paul's Developments whilst the British Red Cross was unrepresented. David Newton, managing director of St Paul's Developments, said; "We are incredibly proud of all we have achieved at Brookfields Park. Our ambitious vision of transforming the extensive former colliery site has been realised over the years and the park is now home to a strong mix of recognisable big brand names and also many home-grown local businesses. "To have delivered so many jobs to the region is an excellent result and we are delighted to welcome the British Red Cross to conclude this ground breaking scheme." Rotherham Council is planning to sell off development plots at Century Business Park nearby and a recent scrutiny review by borough councillors into how the council can support the local economy identified that land supply is a key issue, challenging a task force to identify "the next Dearne Valley."